I wasn't familiar with this type of varigated colored material, but asking the lads, they assure me it is fine for an 'Other Ranks' shirt. The size was spot on. 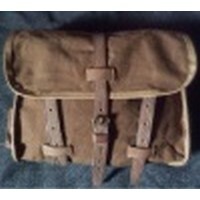 This is yet another great reproduction of a hard to find item. Thanks again Jerry! Long awaited other ranks shirt completes my impression to my standard. Superb and a welcome addition to the inventory. Unique weave is just not available elsewhere. No original handy to compare it to, bit it looks right. Could use little more taper to the cut, little more room across the back. As usual 5 stars! Though I didn´t have anything to compare it with, I have no doubt that is up to your usual standard! !